Your investment in a new roof is protected from both manufacturing defects and workmanship errors. Oasis Roofing is the smart choice when it comes to protection. Does your roof need to be replaced or repaired? That’s a troubling question for many homeowners when dealing with insurance claims. Call Oasis Roofing. We can help! 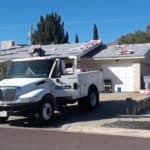 Oasis Roofing has been the leading roofing company in El Paso Texas and the surrounding communities for over 25 years… your local roofing company that you can depend upon for high quality roof coverings. We will help you choose the best option in roof covering materials and solutions. Does your roof need to be replaced or repaired? Call Oasis Roofing. We can help! DID YOU KNOW: STORM DAMAGE IS COVERED BY YOUR HOMEOWNERS INSURANCE. WE WILL HELP WITH FILING YOUR INSURANCE CLAIM. At Oasis Roofing, we use the latest advances in roofing. Non-disruptive green installation. We care for nature. Save you up to 25% on utilities with advanced solutions. Our roofs integrate seamlessly with green energy. 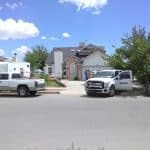 YOUR ROOF MAY BE DAMAGED!